Clear globe also called snow globe,exhibition ball,advertising show ball etc.. 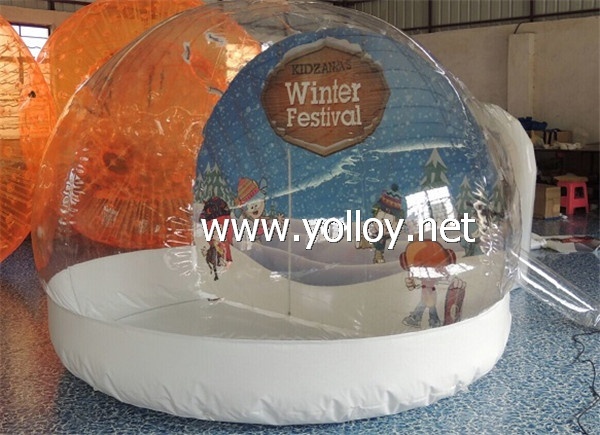 This snow globe is 3m diameter.It used for holiday celebration and a feature for kids take photo inside.The tunnel is transparent,children will be entering the tunnel and the parents can have visibility.And the bottom white part can be paste your company logo or the theme of the activity. The customized printing backdrop is removable.You can change it for different theme. Following are some similar models for your reference. Customized can be acceptable.If you have a sketch and picture,pls send to us.We would like to work with you for a perfect snow globe you want.